This labyrinth exists since 2014. I still have written about a visit of the health garden containing it in my personal Blog (see Further Link below). 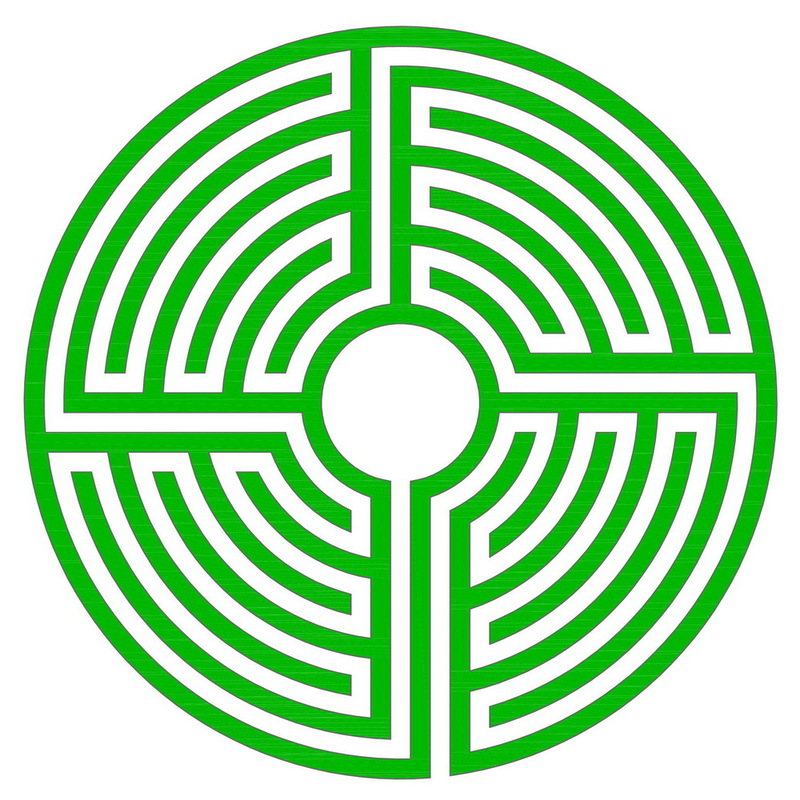 Today we will look at the labyrinth itself. 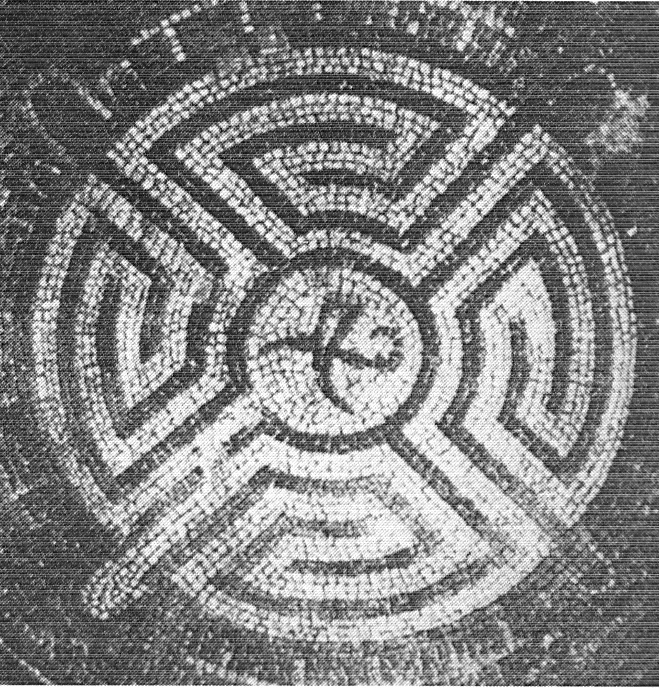 It is a serpentine-type Roman labyrinth with four sectors. The whole diameter amounts to 15 m, the middle has a diameter of 1.40 m. The ways are 40 cm wide and paved with granite stones. They are separated of each other by a 50-cm-wide grass verge. 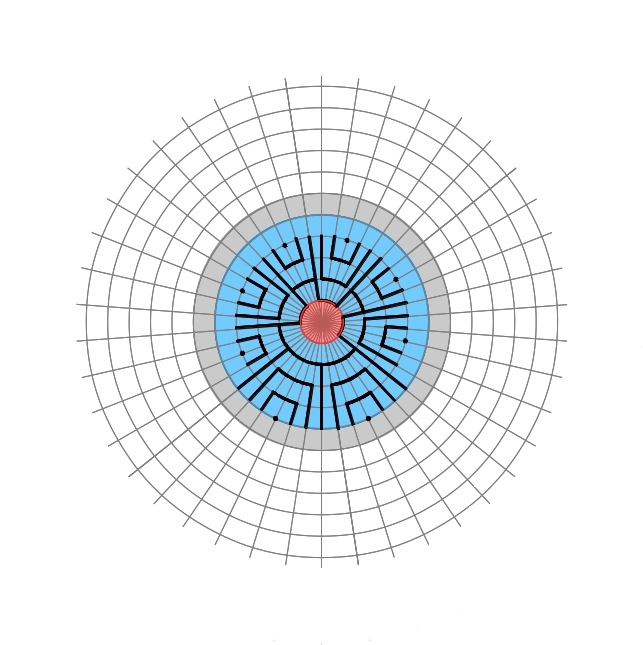 The whole way through the 7 circuits in the 4 sectors to the center amounts to about 182 m. The entrance of the labyrinth lies on the right beside the main axis. The dividing stripes of the single quadrants lie on a cross. In the meantime, I have considered what one could have made better in a “labyrinth-technically” way. Since the idea in itself of a Roman labyrinth in the middle of the health garden seems not to be so good realized. The last piece of the path arriving the center should always lie on the central main axis. If one makes the middle a little bigger, one receives above all longer and steadier path segments around the middle. If one wants to reach this and maintain the whole diameter of 15 m, one can make the paths and the dividing stripes each 40 cm broad. Then the center would have a diameter of 3.2 m.
One could have built a better Labyrinth at the same place and with the same costs. Finally, I got around to visiting this unusual labyrinth from granite ashlars in the Fichtelgebirge. You may reach it over the street from Kleinschloppen to Kirchenlamitz. There is a parking place opposite the restaurant Waldschmiede in the district Buchholz and directly behind it lies the labyrinth. 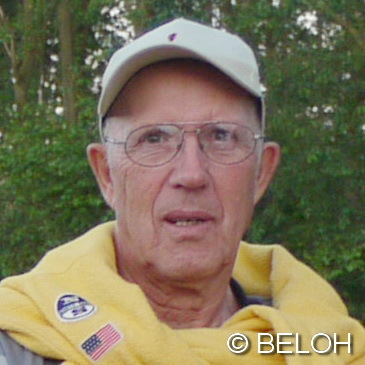 Willi Seiler from Wunsiedel, a former professional schoolteacher in the technical school for stone processing in Wunsiedel had the idea of the labyrinth. The construction works were carried out after the plans of architect Peter Kuchenreuther from Marktredwitz in 2009. 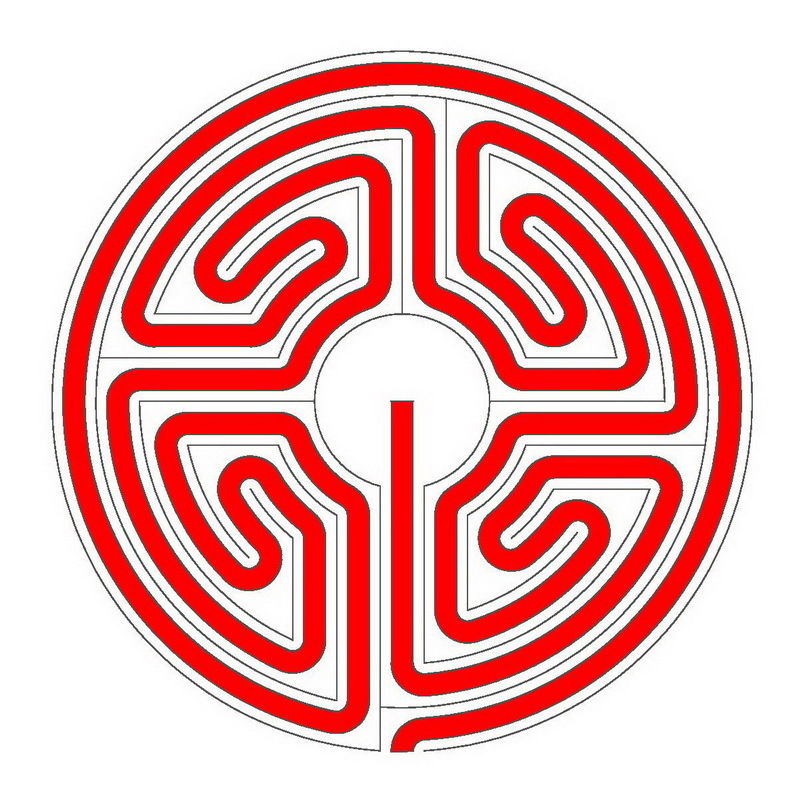 The labyrinth is from type Roman sector labyrinth with a meander in every quadrant and has 5 circuits. It is put on squarely and has the dimensions 34 x 34 m. The middle is a square of 6 m sides length with a 5-m-high obelisk, where Hermann Kern’s famous words: “In the labyrinth you will not get lost. In the labyrinth you will find yourself. In the labyrinth you will not meet the Minotaurus. In the labyrinth you will meet yourself.” are chiseled. The ways and the granite bolders are each about 1.20 m wide. The higher ashlars in the middle and around are about 1.20 m high, the smaller ones inside from 60 to 80 cm. In every quadrant there is a small loophole to leave the way which amounts to 400 m after all. The middle contains the obelisk, some wooden benches and the ground is covered with a paved labyrinth showing the paths enlargedin black stones as it were a negative of the “big” labyrinth. Behind the labyrinth a small hill is raised from which one can overlook the whole area. 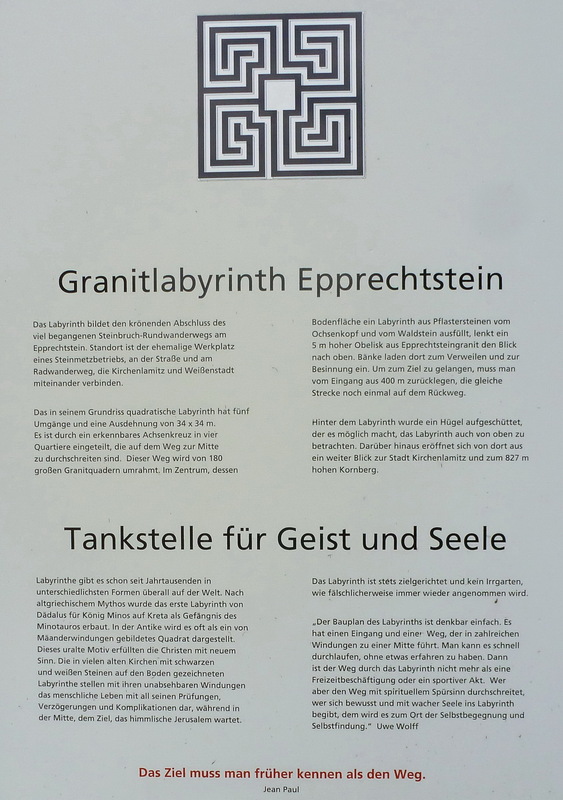 Several boards of information to the geology, fauna, granite quarrying in the Fichtelgebirge among other things as well as to the idea of the labyrinth are put up on the site. Labyrinths still are in the world since millenniums in the most different forms. 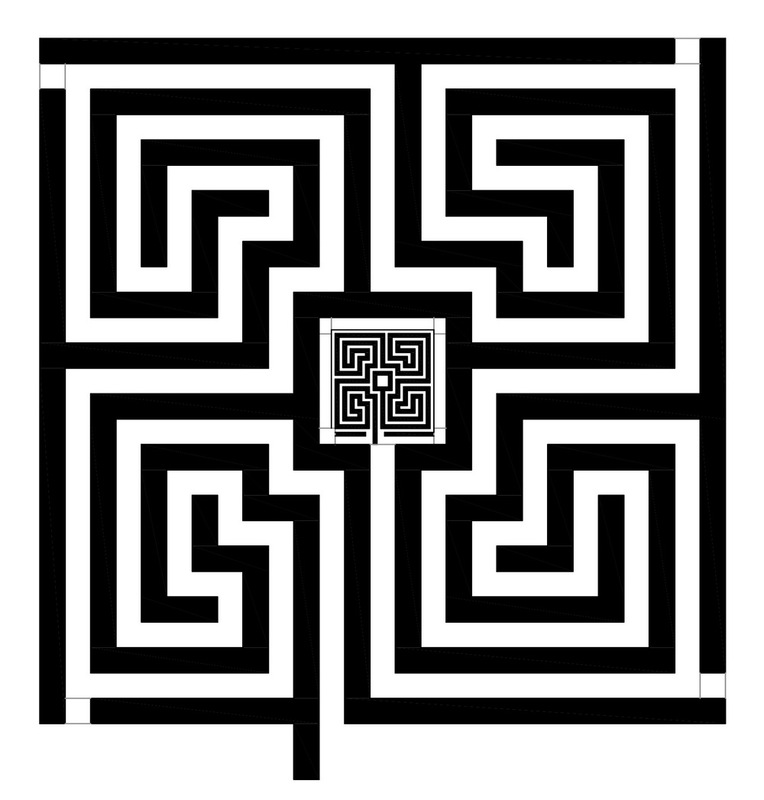 After Ancient Greek myth the first labyrinth was built by Dädalos for king Minos on Crete as a prison for the Minotauros. In the antiquity it is often shown as a square built by windings of meanders. The Christians pervaded this ancient motive with new sense. In many old churches labyrinths drawn on the ground with black and white stones show with their unpredictable bends the human life with all its scrutinies, delays and complications, while in the middle, the aim, waits heavenly Jerusalem. 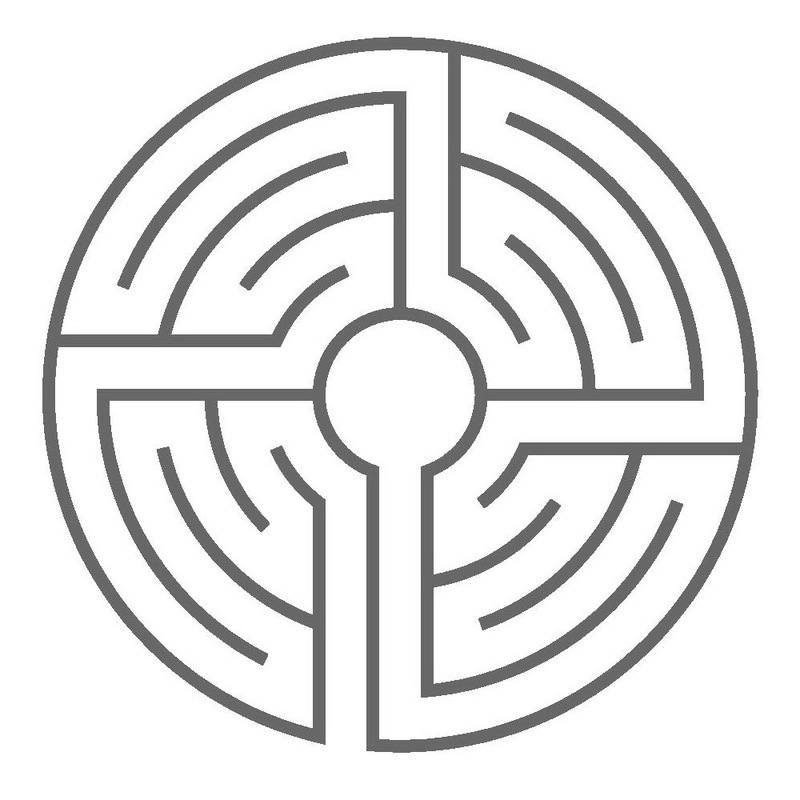 The labyrinth is always purposeful and not a maze, how frequently is falsely presumed. As already three years ago (2011) I could propose a labyrinth draft to this event. The responsibles have decided on a Roman labyrinth of the type Dionysos from a list of 9 different suggestions. It is known since the 2nd century AD, and belongs therefore to the oldest labyrinth types at all. The existing place allows only a labyrinth with approximately 13 ms of diameter. The ways width was 1 m to allow better access. Therefore, only 5 circuits are possible, because the center should also be a little bit more largely. In the design drawing the details are comprehensible. The whole line length of the walls adds up to nearly 150 ms. If one chooses a distance of approx. 50 cm for the lights, one arrives after all at 300 candles. The distance may not be greater any more, because with a path width of 1 m the passageways must remain clearly recognizable. 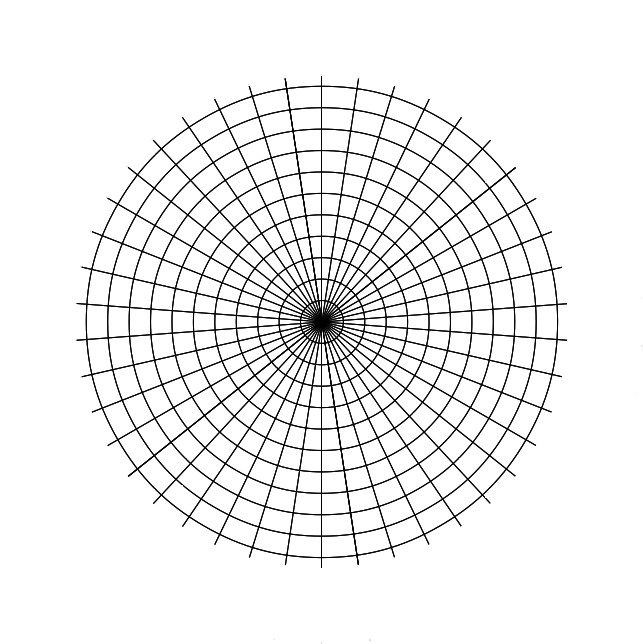 The way into the center adds up to 117 ms.
First one fixes the center and then the vertical main axis. Thereto I use a 3-mm-thick cable with marks for the different radii, hung up with a spring hook in an approx. 1 cm thick iron stick smashed in the center. Then one draws with chalk the inner circle and the external one already taking into account the entrance. Afterwards one marks, outgoing from the lower mark of the vertical axis in the outside circle the horizontal axis on the rigt and the left side, at last still the upper mark of the vertical axis. By applying the chord length of 9.19 m for the 13 m diameter circle this suits best. Now one draws preferably all the straight (vertical and horizontal) lines which begin in the inner circle, and are ending on the 2nd circle, seen from the outside. To this one uses best a second cable or a rope. In parallel distance of 1 m to the previous lines run an other one, beginning at the external circle up to the 2nd circle, seen from the inside. The lower vertical lines proceed in parallel distances of 50 cm, 1 m and 1.50 m to the vertical main axis. This shorter distances one measures up with a folding ruler which must be held more or less at right angles to the main lines. Now one draws the four inner circular segments which begin alternately at a straight line and stop 1 m before the next straight line – and vice versa. 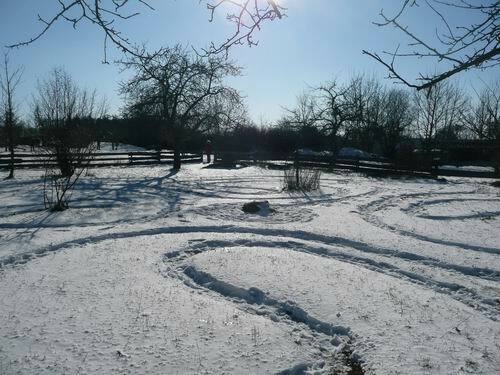 We were four persons and needed about two hours to trace the labyrinth and to lay the light bowls. We had about 270 light bowls, with however, different burning time. Lighting the candles was more difficult this year as three years ago, because of the wind. It took good two hours, although we used a gas burner. And although the children helped. I had written quite different times here in the blog from and about the Schwanberglabyrinth. Among the rest, also that it would be no “real” Roman labyrinth. This is not right as I had to recognise now. 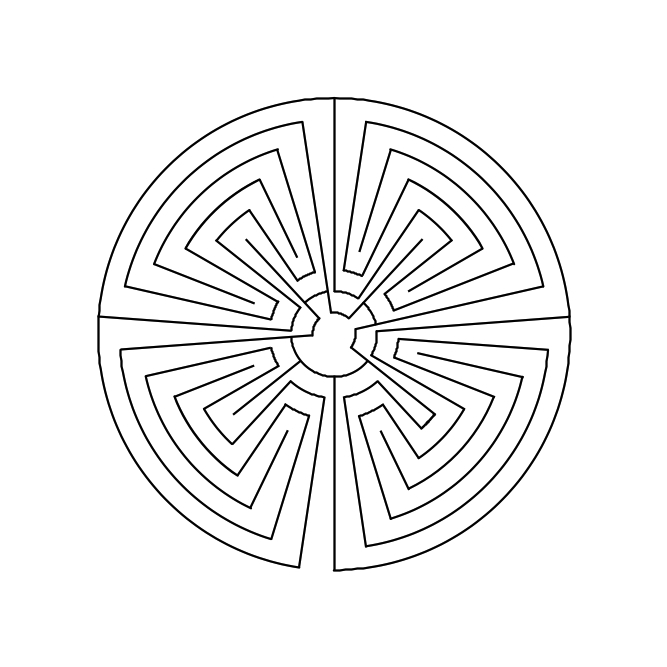 Making the inquiries in Hermann Kern’s book Labyrinths and on the website of Andreas Frei about the Wiesenbronn labyrinth on the Antependium, I have found the right “model” for this type. Here at first once again the original drafts for the Schwanberglabyrinth. In the left corner below is the entrance, then one follows the path from one sector to the next counterclockwise . The white stones are forming the path. One traverses the sectors now in a clockwise direction. 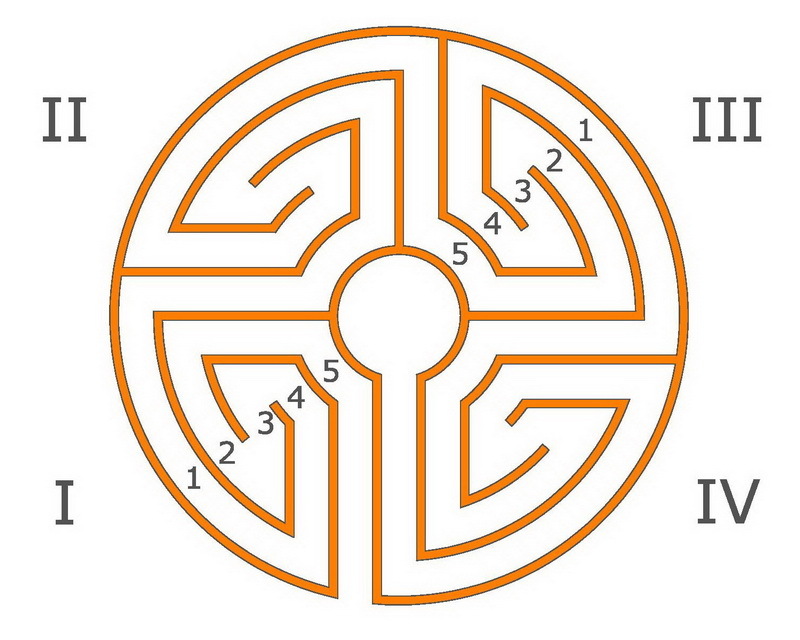 The typical path sequence for this labyrinth reads as follows: A-5-2-3-4-1-5-2-3-4-1-5-2-3-4-1-5-2-3-4-1-Z. We have a Roman or sector labyrinth before us, that leads with four meanders to the middle. 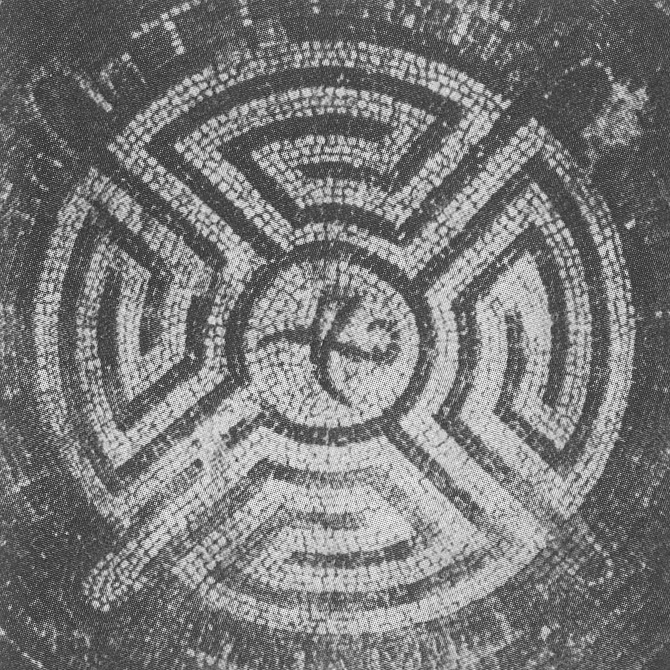 As the first reliable historic evidence comes from the mosaic labyrinth of Avenches from 250 AD, Andreas Frei suggests as a name for this type of labyrinth Avenches (250). If we compare now the above final draft of March 1995 for the Schwanberglabyrinth with it, we will notice that this has one course more. This leads counterclockwise around the whole labyrinth. What maybe still complicates recognising the pattern, is the fact that in the Schwanberglabyrinth the ways are to be seen and not the limitations. They are completely absent. Besides, the alignment is smoothened and the passages from one sector to the other are sloped. The labyrinth is simply carried over to the meadow quite freehand (better: freefoot). Here a look at a geometrically correct drawing with constant path width and sloped changes of direction. There one understands the path’s system better. I can imagine that one can quasi of one’s self find the idea of ​​the convoluted meanders through an intense preoccupation with the labyrinth and that the creators of the Schwanberglabyrinth have developed this type without having seen any model. 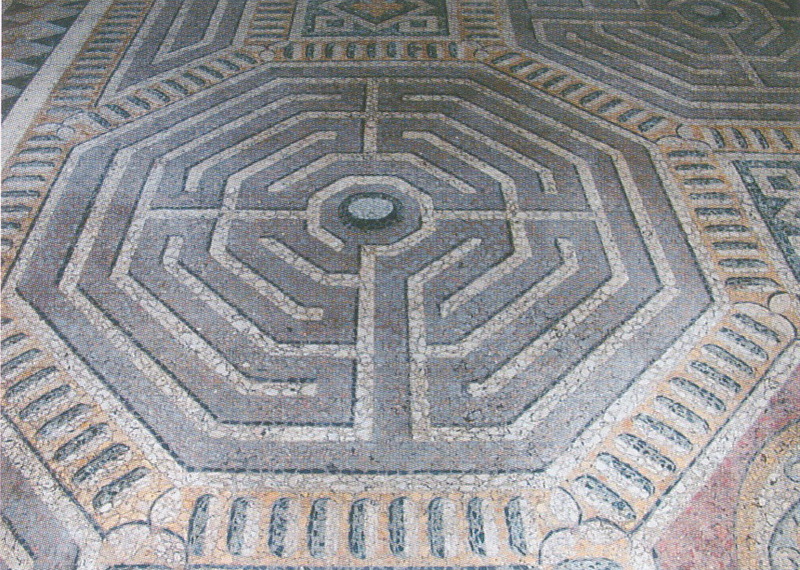 Nevertheless, the Schwanberglabyrinth contains a Roman labyrinth. 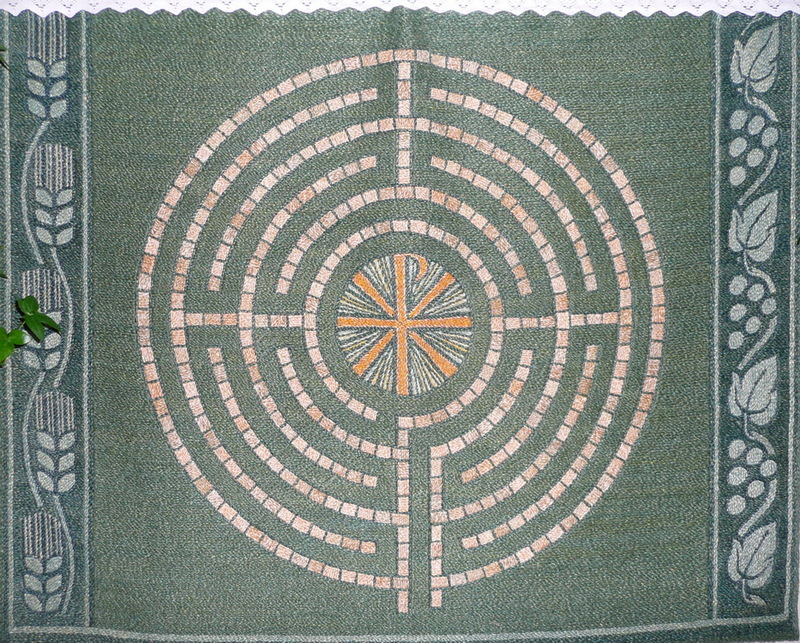 In the church of Wiesenbronn hangs during the “green” church season an antependium (altar frontal), on which a sector labyrinth is stitched. I took notice of it when I visited the Wiesenbronn vine labyrinth. It is an extraordinary representation and I tried to find out more about that. 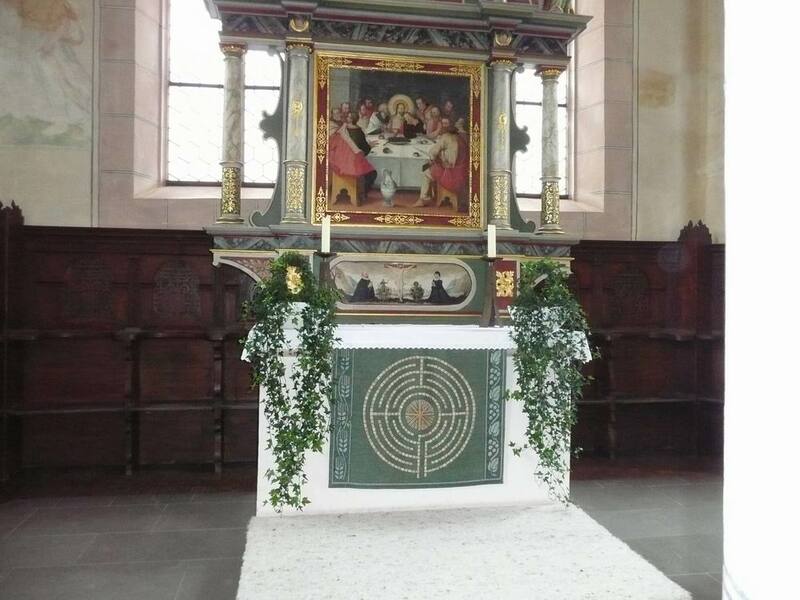 It was purchased probably between 1960 and 1970 under the Protestant pastor Horst Beyer. 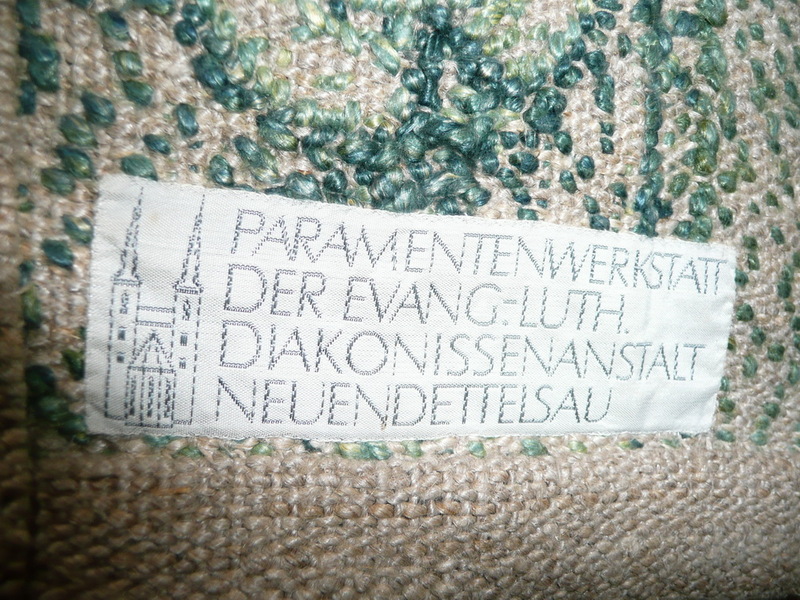 It was produced in the parament shop of the Evangelical Lutheran deaconess house of Neuendettelsau as a label at the reverse side displays. 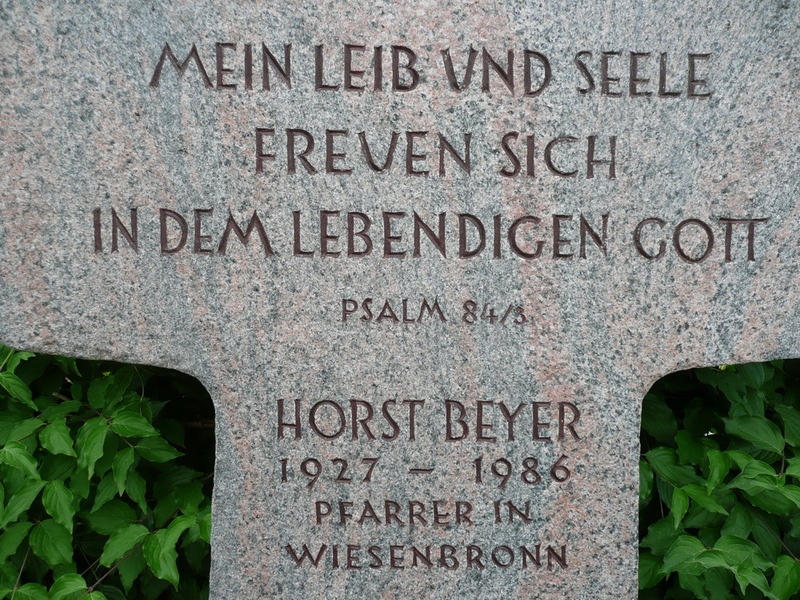 Pastor Horst Beyer acted up to his death in 1986 in Wiesenbronn. He is also buried on the cemetery there and on his headstone another sign of his esteem for the labyrinth is found. At the back side is carved Ariadne’s thread diminished to three circuits. What type of labyrinth is that? The external or geometrical form is unimportant for the classification. 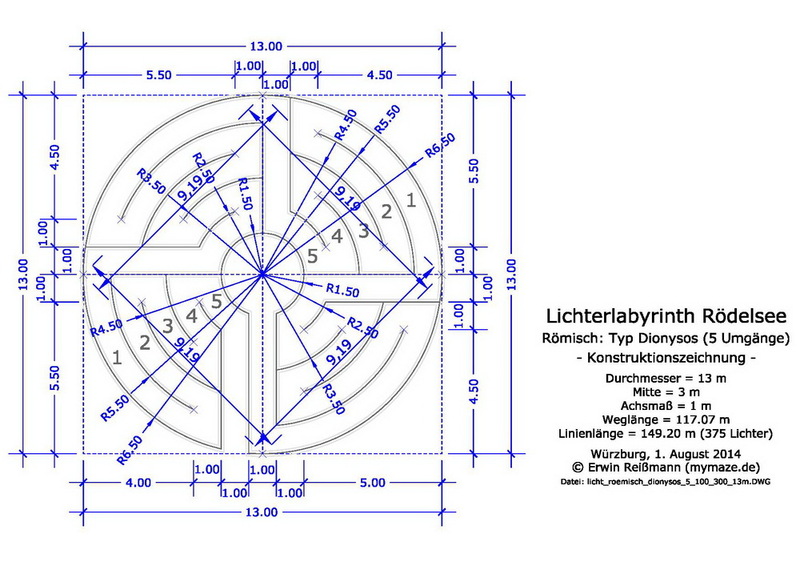 A labyrinth can be circular, square, octagonal or polygonal, it can be right- or left-handed. The path sequence is crucial. 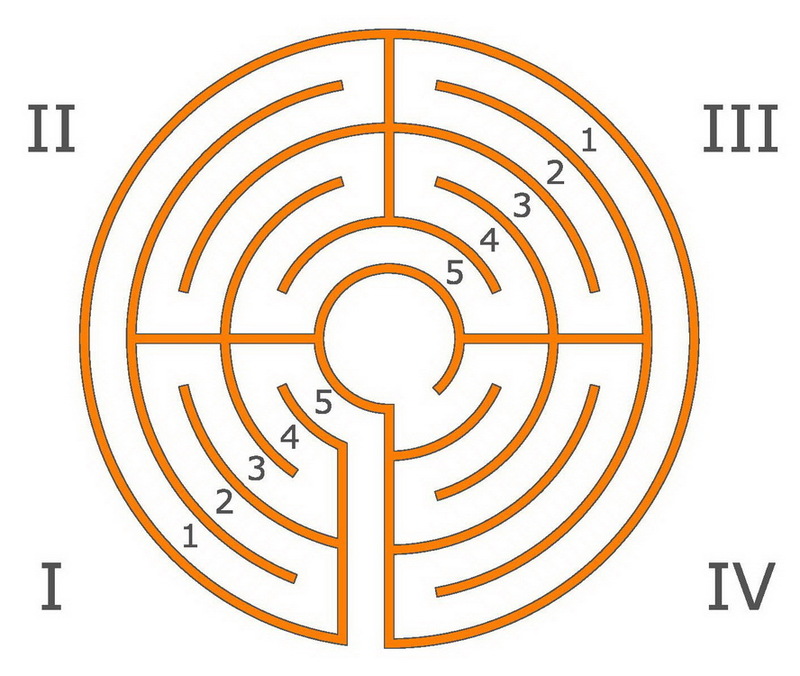 The labyrinth on the antependium is a sector labyrinth with 5 circuits. The sectors are completed entirely one by one. Here the path runs alternately in a serpentine line from the inside outwardly (1st and 3rd sector) and then from the outside inwards (2nd and 4th sector). The path sequence expresses it as follows: Beginning-5-4-3-2-1-2-3-4-5-4-3-2-1-2-3-4-5-centre. That is quite an other alignment or rhythm as in the classical or Chartres labyrinth. When this type appeared first? 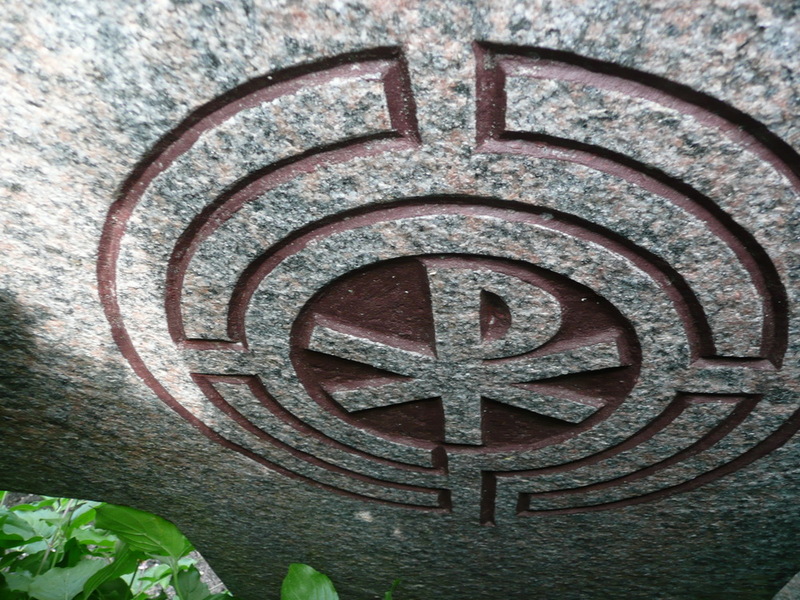 Andreas Frei of Switzerland writes on his website about the pattern in the labyrinth very in detail about the historical labyrinths and her classification. Besides, he also suggests distinct names for the different labyrinth types. 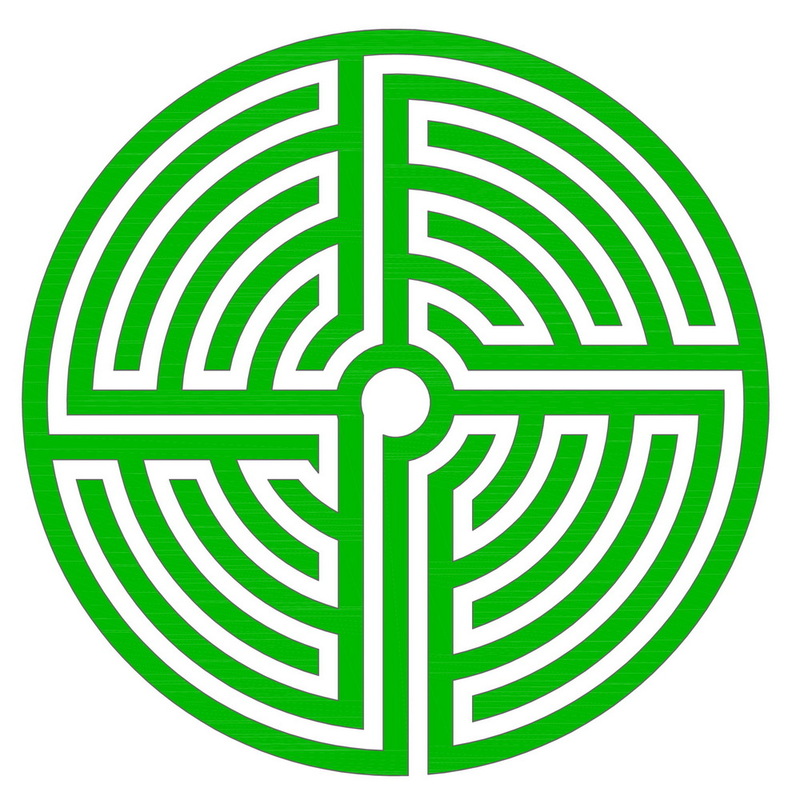 Therefore, “our” labyrinth would have to be called type Filarete (1465). 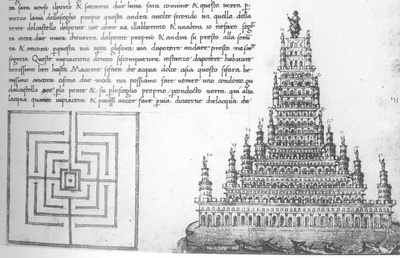 Because it has appeared for the first time as a drawing in a book of the Florentine architect Antonio di Pietro Averlino (called Filarete) about the architecture (Tratto di Architectura) in 1465. In it a square labyrinth of water jumps is illustrated around a 16 floors high step pyramid as a fort for the harbour of Plusiabolis. Where are other examples of this type? There are eight octagonal floor labyrinths in the Palazzo del Te in the Sala di Psiche (completed in 1530), a palace of Duke Federigo II. Gonzaga in the suburbs of Mantua. The concept comes quite originally from Giulio Romano, even if Paolo Pozzo has restored in 1784 the floors. 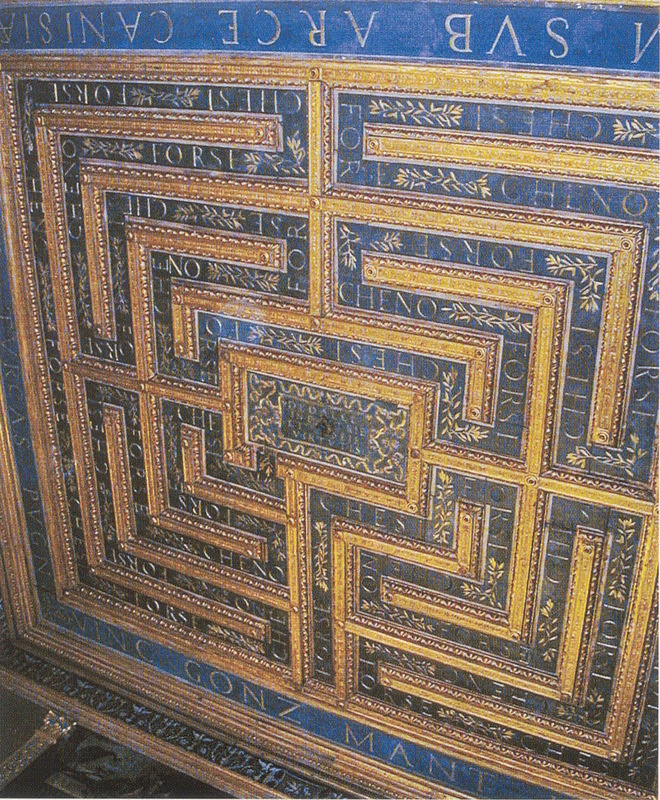 A ceiling labyrinth with the same alignment is found in the Sala del Labirinto in the Palazzo Ducale in Mantua. The hall was rebuild in 1601 from architect Antonio Maria Viani for Herzog Vinzenzo IV. Gonzaga. A contemporary example of the use of this labyrinth type is the plastic >water labyrinthVolker Brüggemann. It is made from Kornberg sandstone and should be put up in spring, 2012 in the Schilde-Park in Bad Hersfeld as a well. 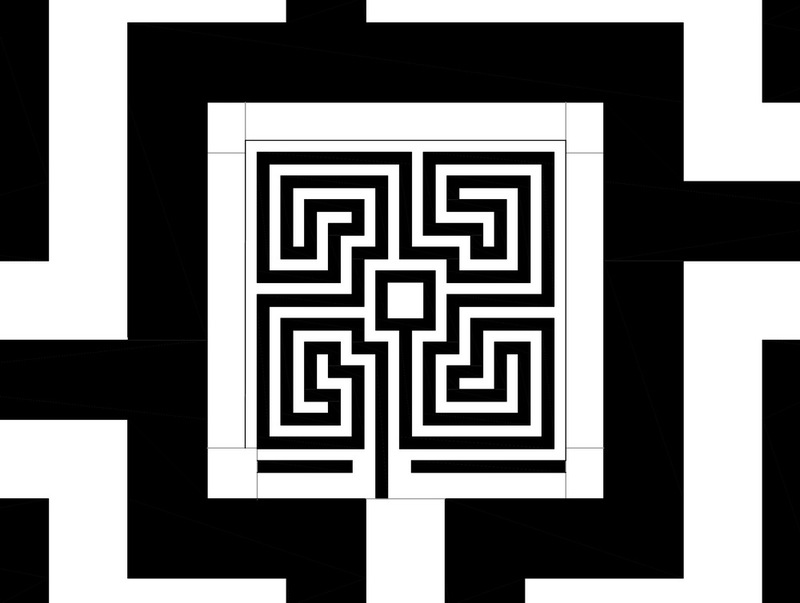 How came this labyrinth type on the antependium? While I inquired in Hermann Kerns book I hit upon a picture which could have served as a reference. Emblems and impreses came into vogue in the 16th century and are illustrated in numerous emblem books. 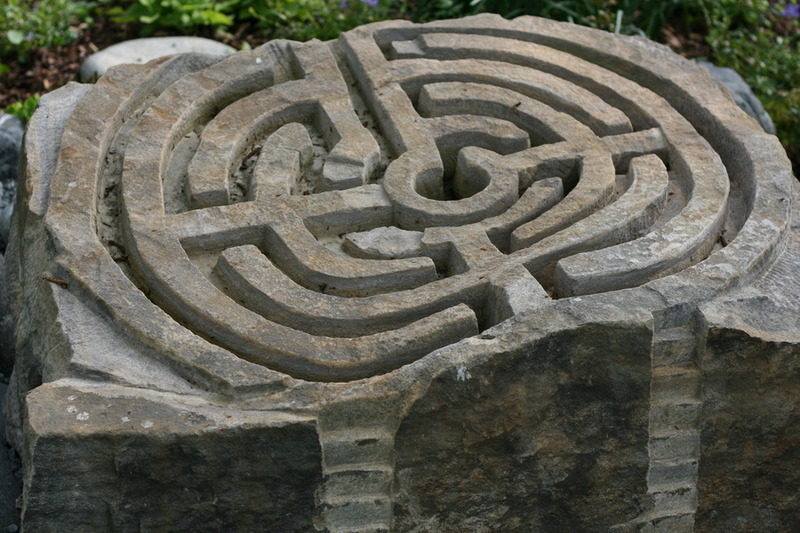 As well the labyrinth was popular in all styles as a symbol. 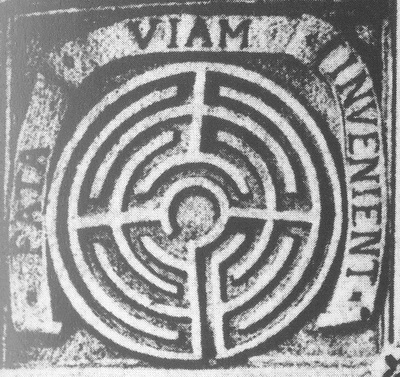 A labyrinth with the device>fata viam invenient< (fates will find the way) is as a relief emblem on the ceiling of a loggia in the castle Dampierre-sur-Boutonne (in 1545-1550) in France. Pastor Beyer certainly did not know the book of Hermann Kern which was first published in 1982. But maybe he had access to an emblem book with the picture?